Escalation? Terrorists fire Grad rockets at southern Israel, hit Lachish and Ashkelon regions. Terrorists from the Gaza Strip fired on Wednesday evening a Grad rocket at the Lachish region. The rocket fell in an open area between Sderot and Kiryat Gat, close to one of the communities in the Lachish Region. One woman suffered anxiety from the fall, but no other injuries were reported and no damage was done. Army Radio reported that the “Red Alert” siren was heard in the communities in the area just before the rocket fell. The report noted that this is the farthest that terrorists have fired a rocket into Israeli territory since before Operation Cast Lead in Gaza in 2009. The report also said that the rocket was likely fired by a terror group which opposes the Hamas government in Gaza. Later, a second Grad rocket was fired from the Gaza region. 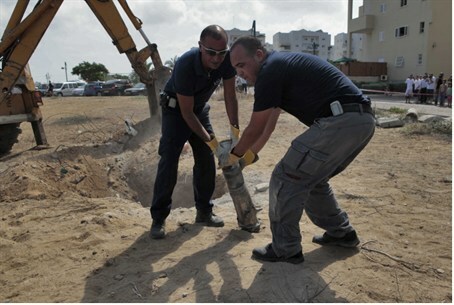 The rocket slammed into an open area near the city of Ashkelon. There were no reports of physical injuries or damage. The "Red Alert" siren was sounded before this rocket fell as well. On Monday, a Kassam rocket was fired from the Gaza Strip towards southern Israel. It landed in an open field near Ashkelon, wounding a Bedouin woman in a nearby tent. In response, IAF aircraft targeted a terror activity site in the northern Gaza Strip and a smuggling tunnel in the southern Gaza Strip.